It was ‘open mouth-insert foot’ time for PGA golfer Sergio Garcia and he will most likely never fully recover from it. 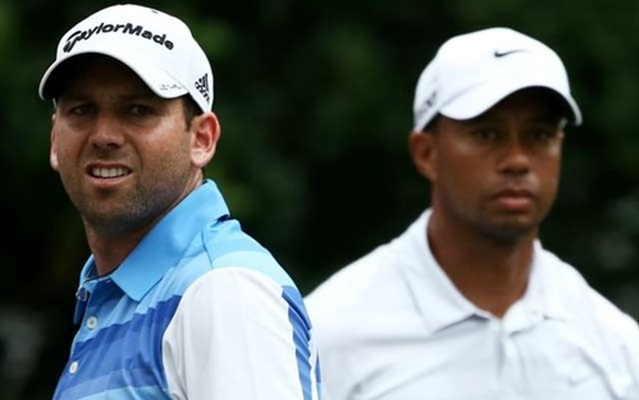 Garcia’s reputation has been forever changed by his ‘racist comment’ about Tiger Woods… and not for the better. He really did say that… why, we’ll probably never know. What could he have been thinking? Because now the world is going to change for Sergio Garcia. He will not be remembered for his golfing, which has never been all that great anyway, but for that little blurb that every news agency on the planet has now picked up on and broadcast adding their own twist to the situation. Garcia and Woods have been at odds for some time now. The rivalry recently came to a head at the Players Championship at SawGrass down in Florida. Garcia complained to anyone that would listen that Woods was responsible for a disturbance that cause his tee shot to go foul and eventually cost him a stroke. Garcia has been a contender on the PGA Tour since 1999. He has 8 PGA wins plus 10 more on the European Tour. He has never won one of the major events and has the notoriety as being a bit of a head case… a whiner… a moaner… and a guy who is always complaining about every little thing. Then he goes and spits into the hole in the middle of a round… a show of disrespect for his fellow golfers that few are likely to forget… especially the guy that had to retrieve his ball from that hole following Garcia’s discharge. Tiger Woods endured a similar comment from veteran golfer Fuzzy Zoeller after winning the 1997 Masters’ Tournament. Woods was just 21 years old at the time but Zoeller’s calling him a ‘little boy’ was defiantly out of line. However, Fuzzy was a product of another time and widely known as a joker on the golf course. Garcia’s comment, coming in 2013, from a professional who should know better, is in excusable. So now Sergio will be remembered not so much as a golfer but as a racist… and a fool.